Home / Updates / 173 paddlers crush the Race to the Dome! 173 paddlers crush the Race to the Dome! For the ninth straight year, we hosted the Race to the Dome, a fundraiser paddle adventure ending at Jefferson City's beautiful Wilson's Serenity Point at Noren Access. For many in the racing community, this is a traditional fall closure to the racing season. Thanks to a generous donation from Missouri American Water, all of racer registrations support the organization's efforts to connect people to the Missouri River through direct action and education. Racers can choose either the 15.8 mile race from Hartsburg or the 27.6 mile race from Providence Landing on Perche Creek. This year, 173 paddlers in 122 boats started and completed the race on a chilly and breezy, but beautiful fall day. Check out complete results here. Racers competed in 28 divisions this year. A really special division is the Adult and Child Tandem class, where an adult pairs up with a child 15 or under to race from Hartsburg to Jeff City. With a rush of last week signups, we ended up with our most competitive Adult and Child race yet! The top three places in this Division, sponsored by Kent and Susan Robinson from Osage Paddle Sports, received Alpine Shop gift certificates. Overall Hartsburg Winner - "Thor" - Savannah & Mike Herbert (1:25:30) - Unlimited Tandem. The Missouri River at Jefferson City was 14.9 feet and 116 kcfs. Deepest gratitude to all the paddlers that came out to support Missouri River Relief. 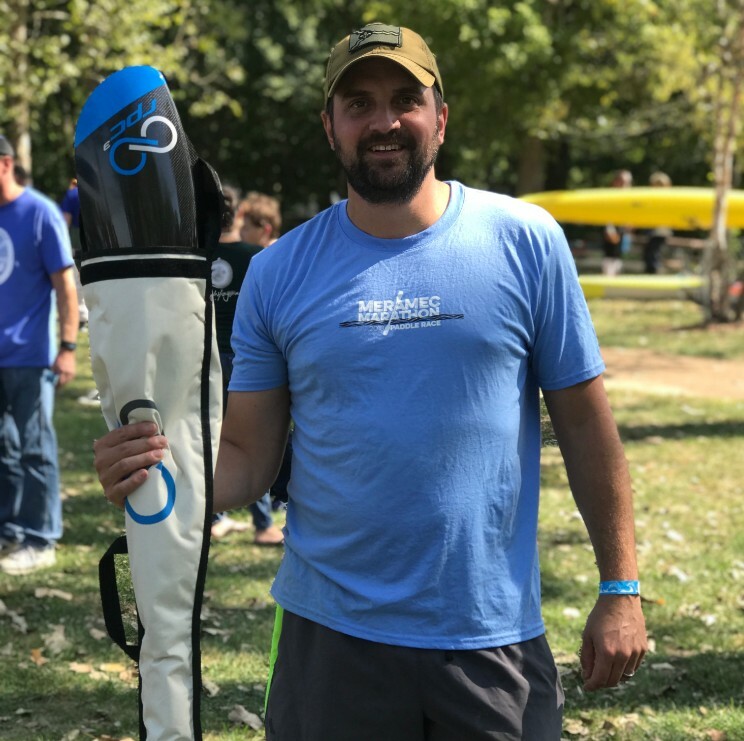 Thank you to all the wonderful volunteers, and to our sponsors, Missouri American Water, Osage Paddle Sports, Ladsurfski, Alpine Shop, Diggit Graphics, Logboat Brewing Co., Fechtel Beverage, Dominos, The Kelley Group and the Jefferson City Parks & Rec. Department. You can download the race results on this Google Drive Spreadsheet. Congrats to Mark Fingerhut who won our Kayak Paddle Raffle! This sweet midwing double blade was donated by Recreational Products of the Carolinas and our board member Terry Merritt. Thanks to all of you who purchased tickets...Thanks to you we raised $800!!!! !